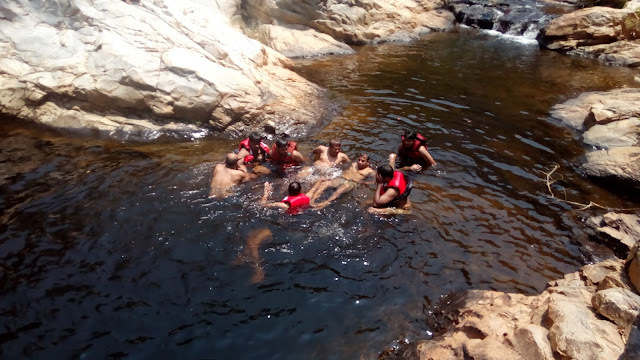 Nagala is always thrilling paradise to swimming lovers, either it is Nagala East or West, both are always best. I had been Nagala West last year with friends & family. This time we decided to explore the Nagala East on 7 – 8th May 2016. We around 12 members set ready to enjoy the natural swimming pools of Nagala East. Unfortunately, my friend Shanthi Prasad dropped out due to family emergency. Hired Tempo Traveler and started the journey. The Bengaluru traffic made us delayed in the city limit, we crossed the Krishnaraja Puram by 1 am midnight. Reached the Nagala East starting point of the temple. We unloaded our packs and all set to venture the East. The weather was cool and we were at right time to start the trek. Hired the guide since we were not sure about the pools. Crossed the Nagalapuram dam and entered the forest. Reached the first pool very soon. Hope we were the first batch to reach this place. Spent good time with diving in the pool. 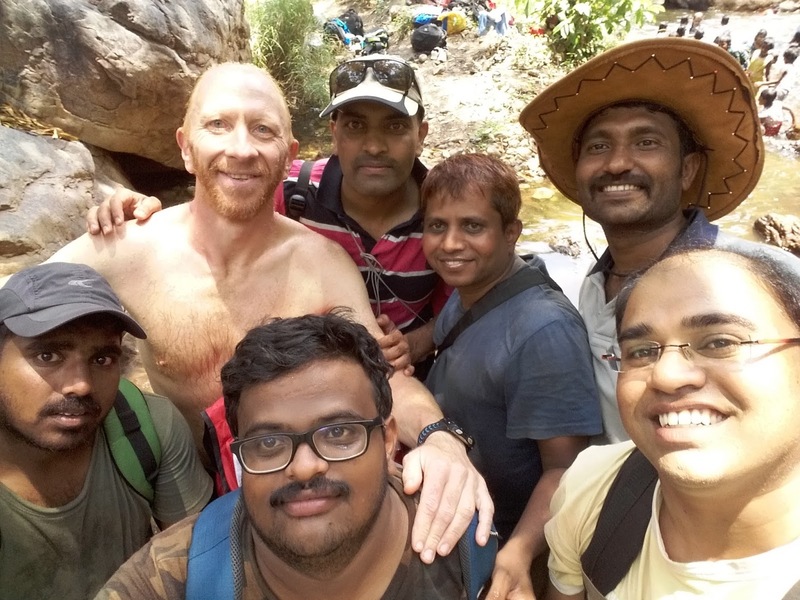 We were enough lucky to meet Chennai Trekking Club found Peter Vein, took a selfie and continued towards next pool. On the way, we finished the lunch. This pool is called Magic Pool. The name itself brief about this magic, you must scroll down along with water and ditch into pool. Initially we all were not sure about scrolling, after one scroll everyone tried repeated dives. After many dives decided to relax and camp the same location. We prepared the camp site and all were engaged in different task. Prepared the Bhelpuri for evening snacks. Very relaxed evening spent such a wonderful place where it is surrounded by cliffs. The dinner was ready, we all had yummy food and relaxed for the day. The morning was very relaxed one, we had to cover one more dead-end pool. Finished the breakfast and continued towards pool. This pool is also very wonder; we can dive from height. The scary part is, the cliffs has many wild honey bees. Guide warned about the bees and instructed how to enjoy without disturbing them. Spent a good time and now the time to head back to Bengaluru. 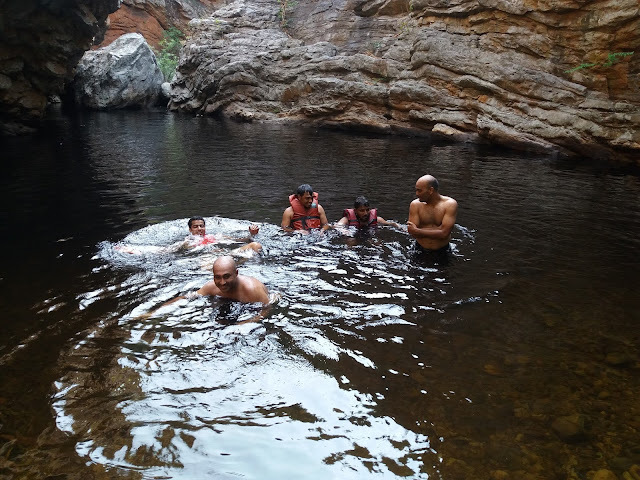 While coming back, we came across one more small pool. It was very crowded, but still wanted to dip in to get relax by humidity. After good relax, boarded the TT. The journey was good, on the way we struck with heavy wind & rain.